NEW DESIGN! Previously featured in the Country Sampler Magazine. I LOVE THIS SET. I'm also giving the option to purchase only the plate if you'd rather. 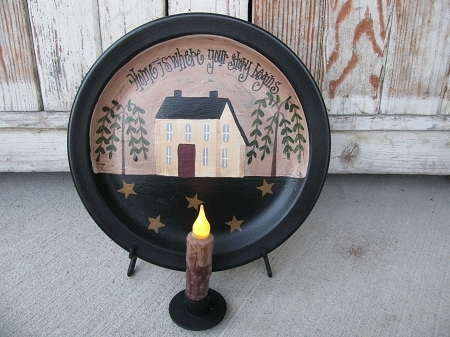 The plate has been hand painted on a recycled dinner plate, most are about 11" in diameter. Then I've paired it with this great plate holder that also holds a battery operated TIMER taper candle. I've chosen the 4" size to better show off the plate design. The saying is HOME IS WHERE YOUR STORY BEGINS. You can chose your rim color on the plate, black is shown. Together the rack stands about 12". Hand Painted by Heidi.